In a nutshell Kin' s Domains are settlements owned and developed by people who prefer living their lives in nature to the hustle and bustle of city life. They provide a sustainable way of living which also helps improve the quality of our planet. The way in which the Kin Domain concept differs from the previous eco-village model is by providing for each family on a Kin Domain a minimum of one hectare, or 2.47 acres of land. A Kin Domain can stand alone, or be part of a Kin Domain settlement or village. Each village consists of multiple 1 hectare or larger plots owned by each family or domain settler. Why one hectare? Because this is a sufficient minimum amount of land sizeable enough to sustain the basic life-long and multi-generational needs of each family or domain settler. This is an amount of land that can be stewarded sustainably by the efforts of an individual or family, without becoming too difficult to manage and that can be managed without the need for heavy industrial agricultural machinery or harmful chemicals and fertilizers or pesticides and without the need for reliance on declining fossils fuels. 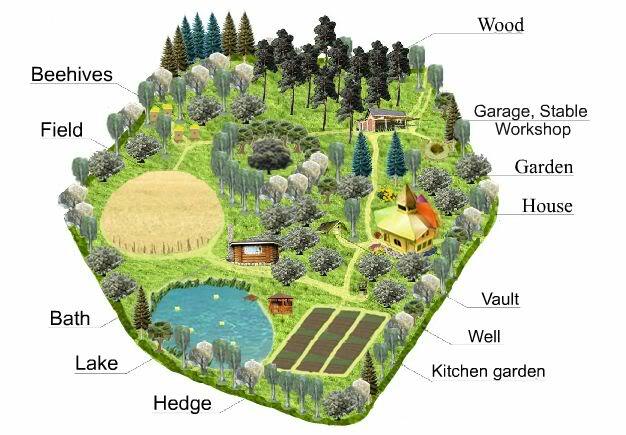 Each plot is created with the specific goal of being a self sufficient area that can support all the basic human needs of the owner including life-long food production, shelter and water supply. Each domain is designed with the specific intent of surrounding the home by a supportive natural eco-system that will additionally support the domain owner by providing the cleaner air created by oxygen producing plant life, creation of forest land for the optional use of timber for seasonal home heating needs etc and a wide variety of other plant life with a focus on edible perennials as well as plants that can be grown for medicinal purposes. Kin’s domain settlements are a new step in eco-village development. They share some elements with general eco-villages: eco-building, recycling and reduction of waste materials, organic food production, use of renewable energy sources, alternative social and economic models and artistic expressions, etc. A kin’s domain settlement is a type of eco-village that ensures upbringing of future generations of families in safe, healthy social and natural environment. They preserve natural heritage, taking into account cultural tradition and the knowledge of our ancestors for many ages.